This entry was posted in 105 N Killingsworth, 11035 NE Sandy, 1325 SW Gibbs, 1500 SE 96th, 1500 SW Taylor (2018), 2124 NW Flanders, 2326 N Vancouver, 408 SE 105th, 5275 N Bowdoin, 8928 SE Woodstock, Chamberlain Hotel, Clark/Kjos Architects, em architecture, Emerick Architects, Fosler Portland Architect, Galleria, GBD Architects, Leeb Architects, Metro Reports, NBBJ, OHSU Elks Children's Eye Clinic, Riverplace Redevelopment, Scotia Western States Housing, SERA Architects, WDC Properties, Works Progress Architecture. Bookmark the permalink. Does the building permit only cover the existing building for the Chamberlain or is the new building that was planned for the parking lot included? This permit is only for the existing building. 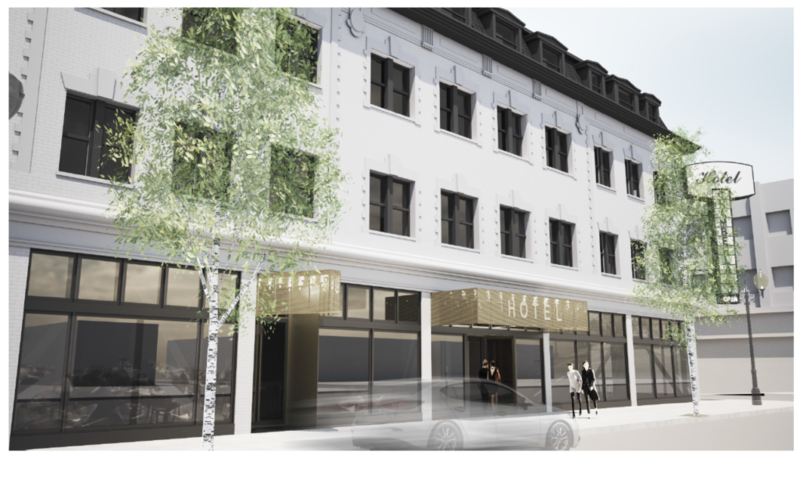 The adjacent project at 550 SE MLK has not yet been submitted for permit. why do rehabs paint over the details of original cladding? This one uniform white. Don’t know how to handle actual details? Got to strip it of personality for that clean line effect? They dumbed down a potential nice looking building.